See a dramatic improvement in your skin in as little as five days! The most effective, inexpensive, natural way to fight and keep acne at bay. And, the best part? It's super easy! Who is Susceptible to a Breakout? We use to think that acne only belonged to a select group of teenagers. As we all know, this couldn't be further from the truth. I decided to draft this tutorial for a couple of reasons. One, 16 years ago (during my mid-twenties), I suffered from acne along my chin (this is common for many girls and involve, or you are highly susceptible to more breakouts. Just washing your face doesn't do the trick. Over time, the cost of Proactive took its toll. It simply wasn't financially feasible for me at the time to try to keep this chemically based three or four step process going. So, I started looking elsewhere, and that is when I made the miraculous discovery of tea tree oil. I haven't looked back since! Not only does tea tree oil clear the skin of many various imperfections, cuts, and lesions, to include acne, it also naturally prevents breakouts! This stuff is a must for any medicine cabinet. The best part is that it doesn't take much of it either. A little goes a LONG way (a 4 oz. bottle can last a person six months to a year!). It's a worthwhile investment to keep this cure-all in your home at all times. While it cures countless issues, right now, we are going to focus on acne. Add This DIY Beeswax Skin Care Ointment Cream to Your Beauty Arsenal! In 2013, acne was estimated to affect 660 million people globally, making it the 8th most common disease worldwide. This remedy below is designed to kick your healing into gear. Once your acne has cleared, you will want to continue this process on a smaller scale. For example, you may take step two completely out and only use straight tea tree oil when you have an occasional breakout or pimple surfacing. This all-natural acne ointment is easy to make and an excellent maintenance tool. As I state below, you do not need to use cold water, at all (even after you move to a smaller version of this routine). Since the ointment contains a lower amount of tea tree oil, you can rest assure that your pores are in good hands. Tea tree oil is powerful stuff! Each morning, when you start to get ready for the day, take a simple washcloth soaked in hot water (as hot as you can stand it). You then need to devote at least one minute to gently rubbing and exfoliating your skin, focusing on the affected skin (such as your face) with the hot cloth. You do not want to rinse with cold water. You want the oil and the ointment to penetrate deep in your pores. Side Note: Tea Tree Oil is known to naturally penetrate and shrink pores far more effectively than cold water. Once you feel as though you have effectively cleansed the skin, you will then want to apply tea tree oil directly on the affected areas. Tea tree oil is very strong and can burn if you are not careful and get it too close to your eyes, you may want to use a cotton swab or cotton ball to apply. Approximately one minute or so after applying the tea tree oil, you need to moisturize your entire face (including the treated areas) with your homemade beeswax based ointment. You don't need a heaping amount of ointment, just enough to create a thin layer to hydrate and protect. While the ointment is being absorbed into your pores, you may do other things to pass the time. Take a shower, brush your teeth, get dressed, etc. When you are ready to finish up your morning routine, gently pat the excess ointment from your face using a soft towel. You are done for the day! Be sure that you follow these steps each evening before bed. The only difference, do not pat the excess ointment from your skin. Overnight, the ointment will be absorbed entirely. Which is something you want it to do! Over time, like magic, you will begin to notice that you wake up to plumper, healthier looking skin. I know that many people advise against popping pimples, and to some extent, I agree. However, there are times when a big fat white bubble on our face feels and looks as though it just needs to burst. This is when I say, "OK! I'm done with you!"! Of course, I don't actually say that, but my thinking is along those lines. This is what I do (with great success and no scarring), I clean my hands and gently take each index finger on opposing sides of the pimple and carefully, with light pressure, push until the white puss begins to extract. Wipe the puss away and if you see more puss, continue, very gently. The minute a small bit of blood begins to appear, STOP! 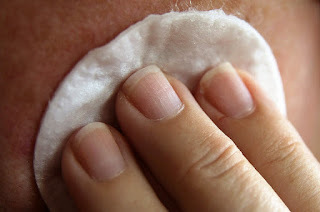 Wipe the busted pimple clean with a tissue and apply tea tree oil directly to the open wound of the pimple (you may do this with a cotton swab). Now, leave it alone! For the next day or two, be sure to apply tea tree oil directly on the busted pimple until it is virtually gone. You'll be amazed at how fast it dissipates! I always am. If you truly want to cure your condition, you have to make a commitment to stay on top of the routine. Every morning, every night. The key to success with conquering and controlling a condition such as acne is simplicity. It comes down to your daily routine. If you truly want to cure your condition, you have to make a commitment to stay on top of the routine. Every morning, every night. Once your skin is healed, you MUST be sure to maintain a minimized version of the routine. Otherwise, you will, without a doubt, find yourself once again, on the frontlines of yet another battle. A last and most importantly to note is, DO NOT TOUCH YOUR FACE WITH YOUR HANDS. If your skin is sensitive (hence acne breakouts), the last thing you want to do is touch your face throughout the day with your hands (that touch everything, i.e. doorknobs, other hands, tables, objects, etc. ).